More and more video projects have been landing on my desk. Shooting HD footage is great, but my old system started resenting me for it. I needed to upgrade to a Crossfire capable card. I will continue building up my firepower in 2011 and having two of these monsters will make editing photos and videos more efficient. 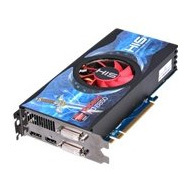 I had a good laugh comparing my old video card, a Sapphire Radeon HD 4650, to the new card. It hurts my brain to see how quickly technology evolves.